Includes 2 shafts, Bearings, Seals and wheel Studs;7.625 inch;28 Spline Kit Why do you need Alloy axle shafts? Because horsepower is useless if can’t get it to the ground. Our performance rear axle kits feature 1541H alloy steel and have been propelling cars to victory for nearly a decade. 1541H is a high carbon steel that contains significantly more manganese than 1040 steel found in your stock axles. This increases ductility and translates the ability to absorb stresses. Our heat-treated and induction hardened shafts have twice the tensile strength than stock and are up to 35% stronger. We use the latest cold spline rolling technology to produce splines that are stronger than traditional cut splines. No cuts means no edges, which create stress points and can lead to fracturing. The shafts are then precision CNC machined and magnaflux inspected for cracks before receiving a slick black anodized or natural finish. 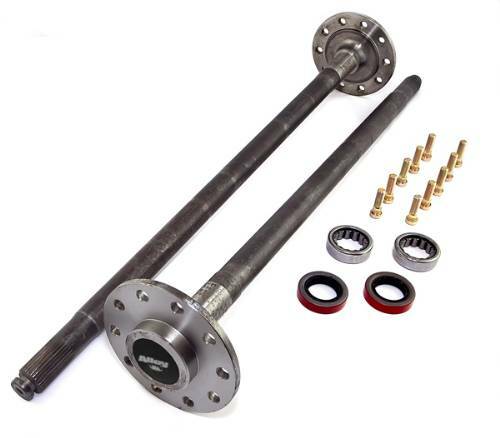 Our rear axle shaft kits include everything you need for your installation: both passenger and drive side shafts, seals, bearings and wheel studs.